Gunung Kerenceng is something of a hidden gem, lying so close to Bandung but little-known outside of local West Java hiking clubs. It can easily be climbed as a day hike, taking no more than 2-3 hours up and 2 hours down. The summit area is a tiny equilateral triangle with sides of just 3 metres and is where three narrow mountain ridges meet. Kerenceng is very accessible but the views from the top easily fool you into thinking you are in a much more remote area. For those who are happy to have a quick weekend trip out of Bandung or Jakarta this is the perfect mountain. Indeed, you could even do it as a (long) day trip from Jakarta. The closest place to stay is the modern and well-signposted Pondok Wisata Aki & Enin (850m) , a popular place with Bandung’s middle classes at the weekends. Note that there aren’t many rooms so you need to book well in advance. Otherwise you’ll have to either camp or stay in a tree-house at the end of the road at the Gunung Masigit Kareumbi conservation area (1,200m) or simply stay in Bandung instead. From the Cicalengka bypass it takes about 15 minutes to reach Aki & Enin and a further 20 minutes to reach the conservation area at the end of the road. The area is popular at weekends because of the impressive Curug Sindulang waterfall which is on the left side of the road about halfway between Aki & Enin and the conservation area buildings. Guides are available at the conservation area and are happy to take you up to the peak of Kerenceng (the highest point in the conservation area) at whatever time suits you. The trail actually starts a little way back down the road at the last village (Tanjung Wangi?) and leads up through villagers’ vegetable fields including cabbage, bean and chilli. The little peak visible on the right is Gunung Buleud (1,423m). As with all trails of this sort there are many junctions between farm plots so a guide is almost essential. After less than an hour from the last village you will be beyond the last of the farm fields and into the pine woodland. The ridge flattens for a while and views in all directions begin to open out. After dropping down into a little crevice and then back up again the ridge gets narrower and narrower and the pine trees become less and less in number. At this point you will see the tiny summit area ahead of you at the end of the ridge. As you get closer to the top you will need to exercise more and more care as a slip here really would have disastrous consequences. Those with a fear of heights may have difficulty on the final section climbing up to the tiny top. Once on the little summit you will be rewarded considerably for what is a very easy hike with a brilliant panorama of genuinely wild areas of West Java. If you found the route up difficult, consider how much more difficult it would have been on either of the other two ridges that meet at the Kerenceng summit. 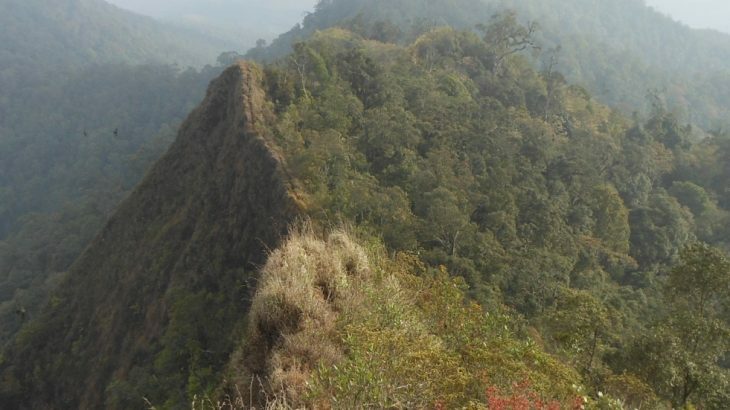 To the left (west) is a knife edge ridge leading to a nameless peak with a height of 1,709m and on the right (northeast) is a jagged ridge leading to a nameless peak with a height of 1,610m and Gunung Pangukusan further round. The latter of these is an alternative route for those approaching the mountain from the Sumedang side. Straight in front of you is a massive, near-vertical drop down into a remote forest area which appears to be full of bird life. If you’re lucky you will be surrounded by swallows as they swoop around the airy summit. After admiring the excellent view, head back the same way to the village and the main road up the mountainside. It shouldn’t take more than 90 minutes to descend to the road where there are plenty of villagers happy to give you a ride back down to the bypass at Cicalengka for just Rp20,000 or Rp30,000 where you flag down a Primajasa bus and be back in Jakarta in no time. 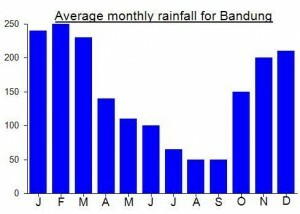 However, you might want to call off at the Sindulang waterfall before heading home. Getting there: Very easy from both Jakarta and Bandung. The best public transport option is to take a Primajasa bus bound for Tasikmalaya or Garut and simply get off at Cicalengka. From Cicalengka, take an ojek up the road to Curug Sindulang (the waterfall). Accommodation: The closest place to the mountain is Pondok Wisata Aki & Enin – a lovely, well-signposted place halfway up the road from Cicalengka to Kareumbi conservation area. It isn’t cheap, and advance booking is recommended, but it’s situated in the middle of rice fields and is a genuinely relaxing place (especially if you like Sundanese karaoke). Permits: No pieces of paper needed, but it’s best to at least speak with the manager at Kareumbi conservation area first. Water sources: None on the hike itself but you shouldn’t need more than 2 litres given how short it is. You’ll need to ask couple of times your path in the farm-fields. !! Once you hike on the East side of the mountain. You will have to take a left (going up) at a point. There is a small inscription “OJ=” at this intersection. The summit is 45 min further. Take care, we got caught in a forest fire and had to climb down in the wild. We saw Eagles and Bores. is that possible to make a camp around the summit? or are there any spot to camp near the summit? You might fit one tent on the summit, Dony. But you wouldn’t want to roll out and over the cliff by mistake! There are a few spots just below the summit that would be ‘ok’, though I cannot remember how flat they were. There was a lot of litter at the top, but it was heartening to see that both the young Sundanese guys accompanying us were also disappointed to see it and quickly set about stuffing a substantial amount of trash into a bag they’d brought along for that purpose. They were also cleaning the trail as we walked up and down. As for “exercising mass control on top,” one of the guys with us told me that people in the villages around Kerenceng claim that no matter how many people climb up there, they’ll all fit. Maybe that’s why there was a lot of garbage? Indeed, Rick. Not only did the guides clear up, they were also incredibly pleasant and genuine lads. Pak Darmanto (manager of the conservation area) seems to have a very nice bunch of staff. I won’t forget the 24-hour warung that Ibu was looking after at 3.50am! While I remember, Rick, please have a look at the NTB page (http://www.gunungbagging.com/province/nusa-tenggara-barat/) and see if you can work out which mountain you were on when you hiked in Sumbawa and whether or not you can roughly locate the village of people with pale brown eyes. As I mentioned, we currently have no information for any peaks on that island except for Tambora. This peak was a real surprise. I had heard from Java Lava’s circular that the summit was pretty special but nothing quite prepares you for the sudden view you get at the top. After visitng Cangkuang temple near Leles I got an ojek all the way to Cicalengka (to avoid the nausea and horrors of sitting in angkots while the driver searches for passengers and stops every couple of minutes). I didn’t know what to expect with the Pondok Wisata Aki & Enin but it turned out ot be in a beautiful location – in the middle of rice fields and next to a little river. Wonderful. But remember to bring beer as they don’t have any. There’s even a little karaoke area. I was lucky to get the very last room available which wasn’t cheap but for the location it was worth it. The security guys agreed to take me and my companion up to the end of the road to meet our guides the following morning for a 4am start. After an interesting chat with the Ibu who runs the place, and lots of cake, and some endearingly out-of-tune Sundanese karaoke I headed to bed for 5 hours of sleep. We were at the conservation area by 4am and after being slightly overcharged by the Aki and Enin security guys we started to look around for our guides. Took a while as they were still asleep! Anyway we were off by 4.30am and up on the peak by 6.30am. Not the finest of weather but what a view from the top. Tens of swallows circled the peak and the mists began to rise slightly but remained substantial enough to make neighbouring peaks and ridges look rather majestic. Java Lava’s comment that they ‘may have to exercise mass control on top’ was actually pretty apt given the lack of space. Quite difficult to get more than 5 hikers up there without being worried about people falling over the edges. The only sad thing about the summit was the amount of litter left by previous hikers. When will local hikers learn to have a little social conscience and clean up after themselves? We were back down in no time and onto ojeks past the market stalls overlooking the vast plains of Bandung and down at the Cicalengka bypass. The traffic was brilliant, still being so early on a Sunday and it can’t have been more than about 4 hours from the top of Kerenceng to the Kampung Rambutan area of Jakarta!